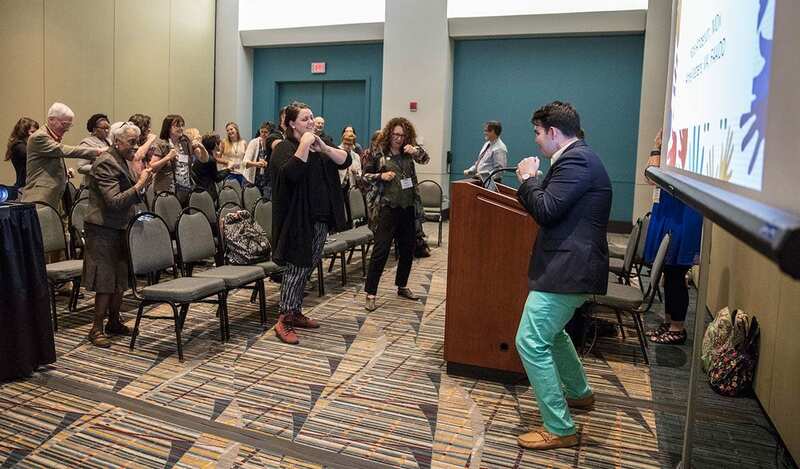 Conference attendees follow the lead of Thomas O’Connor ’17 during a “brain break” at the American Association on Intellectual and Developmental Disabilities Conference. 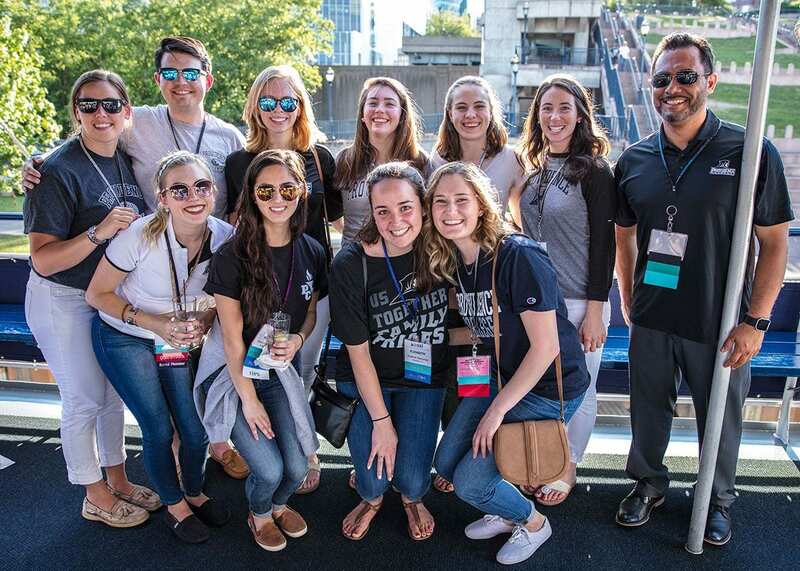 As they approached their final semester at Providence College, 10 seniors were offered a unique opportunity. Dr. Anthony M. Rodriguez, assistant professor of education, asked the nine education/special education majors and one math major to prepare and present two research papers at the American Association on Intellectual and Developmental Disabilities Conference in Hartford, Conn. Founded in 1876, AAIDD is the oldest and most prestigious organization in the field, and the four-day conference drew more than 600 leading professionals from throughout the world. The PC students would be the only undergraduates attending and presenting at the conference. While student teaching and preparing for graduation, the seniors eagerly took on the challenge. Their PowerPoint presentation, “Embedded Sensory Integration Activities for Mind and Body,” focused on the importance of brief body movement breaks led by teachers to improve students’ focus. The second poster presentation, “Becoming Colleagues,” emphasized the importance of support, freedom, and interdependence in self-directed teaching. Presenting their research during a conference workshop are Megan Tucker ’17, center, and rear, from left, Alysha DeCrescenzo ’17, Thomas O’Connor ’17, Elizabeth Sideravage ’17, and Jamie Metzger ’17. Presenting at the conference were Lauren Biddell (Wantagh, N.Y.), Jacklyn Brehm (Latham, N.Y.), Alysha DeCrescenzo (Riverside, R.I.), Reed Fraser (Troy, N.Y.), Shannon McMahon (Basking Ridge, N.J.), Jamie Metzger (Derry, N.H.), Thomas O’Connor (Melrose, Mass. ), Elizabeth Sideravage (Waterbury, Conn.), Megan Tucker (Branford, Conn.), and Lauren Wyse (Dorchester, Mass. ), all members of the Class of 2017. After hours of precise preparation for their presentations, the seniors received tremendous positive feedback from leaders and participants during and after the conference. “Mainly, the researchers found the ten students we sent to the conference as strikingly well prepared, professional, bright, and cool under fire,” said Rodriguez of the student’s formal presentations. Yet, it was their informal presentations that earned the most recognition. After reviewing the students’ submissions before the conference, the leaders of AAIDD requested that the PC group lead sensory integration activities — described in one of their papers as “brain breaks” —something that had never been done before with conference attendees. The brain breaks exercises evoke smiles and laughter at the conference. Brain breaks, are one- to five-minute movement breaks implemented by teachers throughout their daily instruction. Rodriguez teaches them in his PC classes and strongly believes they can help change classroom culture. Consisting of active, energetic movement, meditation, stretching, and yoga, brain breaks are designed to give students a mental break from their class work and help them to energize and refocus. 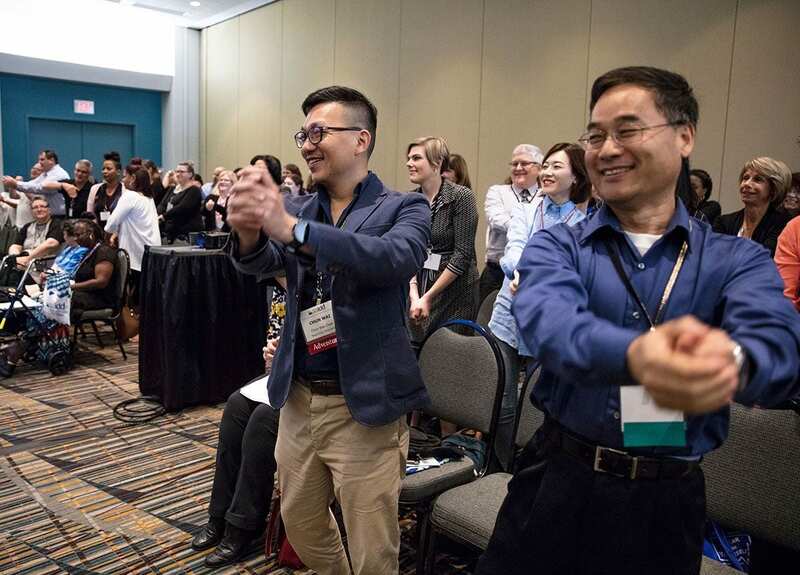 As the professionals listened to presentations filled with data and analysis, the students divided into teams and entered each meeting room midway through the two-hour sessions for a brain break. Doctors, lawyers, college professors, policymakers, program directors, psychologists, and teachers were led in a variety of brief movement activities, pretending to swing tennis rackets, bounce basketballs, or swim to upbeat music. Some did Qi Gong exercises, similar to tai chi, to release negative energy. Others pantomimed playing air guitar or drums, while some did a zombie walk. In an email to the PC students after the conference, Dr. Susan Havercamp, associate professor at The Ohio State University, president of AAIDD, and an international figure on IDD, noted the impact they made at the conference. “Brain breaks were easily the most successful feature of this year’s meeting,” Havercamp wrote. “I was impressed by the amount of planning and forethought evident in your activities. I was also struck by your professionalism and confidence in leading large group activities. The students seemed to enjoy the reactions of the participants as much as they did leading the exercises. Preparation was the key to the students’ presentations. They met weekly to discuss plans for their papers and presentations, share research, and edit their work. Following the meetings, they worked independently on the paper, research, and practicing different brain breaks. After commencement, they continued to work on their own and held weekly zoom video meetings. The students’ collaboration also made the experience successful, said Rodriguez. “They had a lot of self-determination. They were a really tight-knit group. They had a sense of teamwork that I was very impressed with,” he said. Team members and their professor, Dr. Anthony Rodriguez, gather for a group photo prior to a boat cruise that kicked off the conference. The students are, front from left: Lauren Wyse ’17, Alysha DeCrescenzo ’17, Elizabeth Sideravage ’17, and Shannon McMahon ’17. Rear: Megan Tucker ’17, Thomas O’Connor ’17, Lauren Biddell ’17, Jamie Metzger ’17, Reed Fraser ’17, and Jacklyn Brehm ’17. Based on their research and experiences shared at the conference, the presenters are writing two detailed research papers to submit to academic journals. They continue to collaborate through video meetings. These recent graduates appreciate the unique challenge they were offered. “The opportunity to not only present at the AAIDD, but the experience of creating a legitimate article on what we presented is an unbelievable one. To have this experience less than a year out of our undergraduate education is a rare one, and we have Dr. Rodriguez and his mentorship to thank for everything,” said Brehm. Rodriguez felt the students’ success was largely their own doing.